It was scored by Bill Conti, with lyrics (only 30 words long!) by Carol Connors and Ayn Robbins. The vocals were performed by DeEtta West and Nelson Pigford, in a recording that lasts a mere 2:48. However, those few minutes are crucial to pop culture: it accompanied Rocky (Sylvester Stallone) up the steps of the Philadelphia Art Museum, and is forever associated with underdogs who are fighting their way toward a goal, often accompanied by a montage noting their progress. Our documentary, John G. Avildsen: King of the Underdogs, includes a behind-the-scenes look at the original Rocky, including how its underdog theme was captured in music.In addition to the original Rocky, Avildsen directed all three Karate Kid films, as well as Save The Tiger and Joe. His gift for underdog stories inspired millions of filmgoers and influenced popular culture for decades (yet Avildsen is barely a household name). He received a Best Director Oscar for his work in Rocky; in all, he directed seven actors to Academy Award nominations. “Gonna Fly Now” was also nominated for an Academy Award in 1977, for Best Original Song (it lost to Barbara Streisand’s “Evergreen,” from A Star Is Born). However, United Artists released it as a single. Like an underdog, it fought its way to the #1 position on the Billboard pop chart after 20 weeks, on July 2, 1977. The magazine ranked it as the 21st most popular song of the year, exceeding over one million copies in record sales. That same year, the song was also interpreted by jazz trumpeter Maynard Ferguson. That version spent 13 weeks on the Billboard charts, reaching as high as #28. “Gonna Fly Now” was also given the inevitable disco treatment — Rhythm Heritage, a hitmaking instrumental group that also disco-fied the TV themes from S.W.A.T. and Baretta, took its version of “Gonna Fly Now” to Billboard‘s Hot 100 (#94). The American Film Institute included the theme in its 100 Years…100 Songs list (#58). The song lived on far past 1977. It was reincarnated in different forms in future Rocky films, including Rocky II (1979), which featured a children’s chorus, and Rocky V (1990), in which two different versions of the original song were played. Rocky Baboa (2006) brought back the theme yet again, with additional brass as well as a vocal remix. Creed (2015) sampled the first few notes of the song during the film’s final fight scene. Composer Bill Conti attended Julliard, but his big break came in 1976, when he composed the Rocky theme. Director John G. Avildsen wanted noble, fairy-tale, no-nonsense music for his fighting underdog. The song, which earned Conti an Oscar nomination, also cinched him the job as musical director of the that Academy Awards program (he has held this position 18 times since then, more than anybody else). Avildsen asked him to compose the music for another of his underdog movies, The Karate Kid (1984). 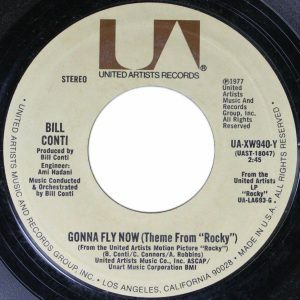 The success of the “Theme From Rocky” brought Conti into the spotlight as a go-to composer for film and TV. He scored the music for the James Bond film For Your Eyes Only (1981). During the rest of that decade, he created classic TV themes for Dynasty, Falcon Crest, American Gladiators and Cagney & Lacey, among others. A reason to live: a 21st century update on one of director John G. Avildsen’s most famous underdogs. 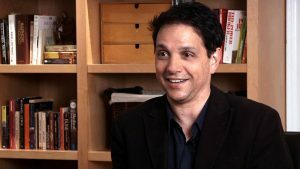 YouTube Red will present Cobra Kai, a ten-episode sequel to the original 1984 film, The Karate Kid. The Hollywood Reporter exclusively broke the news of the straight-to-series sequel, with stars Ralph Macchio (Daniel LaRusso) and William Zabka (Johnny Lawrence) reprising their original roles. The two sat for a press conference after making a surprise appearance at the Television Critics Association summer press tour. The actors remained friends during the thirty years that had passed since the original film (which included three successful sequels and a 2010 reboot). Entertainment Weekly called the original Karate Kid one of the 50 best high school films of all time (#40). Our documentary, John G. Avildsen: King of the Underdogs, includes a behind-the-scenes look at the original Karate Kid, and how its underdog theme forever connected with audiences. In addition to all three original Karate Kid movies, John G. Avildsen’s films include the original Rocky, as well as Save The Tiger and Joe. His gift for underdog stories inspired millions of filmgoers and influenced popular culture for decades (yet Avildsen is barely a household name). He received a Best Director Oscar for his work in Rocky; in all, he directed seven actors to Academy Award nominations. This includes The Karate Kid‘s Pat Morita, who was nominated for Best Supporting Actor in 1985 for his role as teacher Mr. Miyagi. The story takes place three decades after the original All Valley Karate Tournament. A down-and-out Lawrence seeks redemption by reopening the Cobra Kai karate dojo, which reignites a rivalry with LaRusso. The series is written and produced by Josh Heald (Hot Tub Time Machine) along with Jon Hurwitz and Hayden Schlossberg (Harold and Kumar). The ten half-hour episodes are set to stream in 2018. 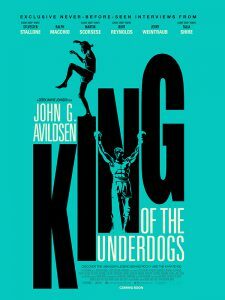 Click here to find out more about our documentary, John G. Avildsen: King of the Underdogs. Click here to discover more great Chassy documentaries. Rocky reveals this back story to Adrian on their first date, at a vacant ice-skating rink: “Yeah – My ol’ man, who was never the sharpest, told me – I weren’t born with much brain, so I better use my body.” This small detail starts the underdog engine of the first Rocky flick, directed by John G. Avildsen. Our documentary, John G. Avildsen, King of the Underdogs, examines Avildsen’s astounding (yet widely unknown) directing career and his expert handling of the underdog story — a genre much more difficult to convey than outwardly seems. The commonly understood meaning of “underdog” is a person or fictional character who is expected to lose, but wins (think Cinderella, the 1980 U.S. Olympic Hockey Team, Seinfeld greenlit for a second season, and the 1969 New York Mets). Avildsen understood underdogs, which means he knew how to interpret Sylvester Stallone’s script. The combined power of Stallone and Avildsen energized the underdog story: Rocky was plucked from obscurity to fight World Heavyweight Champion Apollo Creed; Rocky knew he didn’t stand a chance, but his plan was to remain standing when the final bell was rung — an admirable but near-impossible goal. This is essentially and symbolically every underdog’s story: remain standing at the end. Survive. Says Apollo’s trainer: “He doesn’t know it’s supposed to be a show. He thinks it’s a damn fight!” Had Rocky beat Creed, the story would not feel as genuine. Avildsen, an underdog himself in Hollywood, inspired millions of fans to realize their own potential to go fifteen rounds and remain standing. The film itself is an underdog story, initially dismissed as a hokey B-movie most suitable for a drive-in; it ultimately earned 1976 Oscars for Best Picture and Best Director for Avildsen himself. He went on to direct all three Karate Kid movies, all of them successful. The average moviegoer may easily recognize director names like Steven Spielberg, George Lucas and Martin Scorsese, but Avildsen — despite his film legacy — remains a head scratcher (our documentary hopes to change that). In a cinematic case of a rising tide lifting all boats, Rocky Balboa’s underdog story causes a chain reaction that affects those around him. Mickey Goldmill: this calorie-burning performance by veteran actor Burgess Meredith earned him a Best Supporting Actor nomination, as well as a forever place in pop culture. Mickey, the manager of Rocky’s gym and a crusty father figure, vocally expresses his disappointment in Rocky falling short of his potential. This sparks Mickey’s own underdog story, whereas Rocky hires him as his trainer for the Big Fight. Mickey, at age 76, sees this as his last-ditch grab at greatness, and as a one-time chance to reverse the neglect that caused Rocky’s career to suffer. 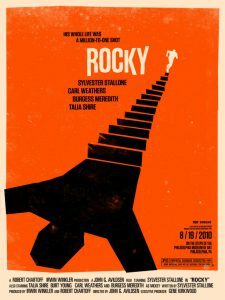 As the film progresses, with the help of Bill Conti’s goosebump musical score, the energy changes from negative to positive for both Rocky and Mickey. Mickey himself had a lackluster boxing career before he opened a gym. He laments that he never had a manager, something that he claims Rocky needs in order to fulfill his potential. Mickey finds the courage to ask Rocky for the chance, but the job request is not easily granted, due to past resentments. In the end, though, amends are made; Mickey becomes Rocky’s manager, completing the circle of life. Score one for the underdog. Adrian Penino: Talia Shire’s underrated performance takes the “ugly duckling to beautiful swan” underdog story beyond cliché. Adrian works in a neighborhood pet store, frequented by Rocky. She’s introverted, cerebral, insecure, and stifled by her tyrannical brother Paulie. Her underdog credentials are impeccable: her late mother told her that she wasn’t pretty and that she should develop her mind, her brother/roommate orders her around like a slave, her boss at the pet shop treats her shabbily, and she has a hard time making eye contact with customers. Rocky’s romantic interest in her unlocks her own potential and confidence. Rocky and Adrian make quite a surprising match; the match is lit for her eventual fashion makeover and, even more importantly, her newfound independence. Her finally standing up to her maniacal brother is one of the most powerful scenes in the film; it shows the power of the underdog when the rage is unleashed and handed back (later, Rocky will demonstrate this in the ring). It’s then when Adrian finally finds her voice and her power, and it’s loud and strong and clear and articulate. Another reason to cheer. Rocky’s greeting, “Yo, Adrian,” has become a pop culture catchphrase, and Shire’s performance earned her a Best Actress nomination. Cuff and Link: Rocky’s pets are not underdogs but turtles, yet they bring a strong underdog symbolism to the story. Rocky, Mickey and Adrian are like turtles; they’re small and somewhat helpless, withdrawing into their hard, rough shells. Love and care are what bring them out, and keep them alive. Astounding trivia fact: Cuff and Link, who are both female and known technically as red-eared sliders, survived another 30 years to make a second appearance in the movie sequel Rocky Balboa in 2006. One of the best rewards of a well-told underdog story like this one: giving yourself permission to cheer. Out loud. And maybe even doing so while rising up (both physically and spiritually). Theater audiences have done this at Rocky screenings for decades, but don’t deny yourself this pleasure if you’re screening this joint on a digital-age device. Allow yourself to give three cheers for Rocky, Mickey and Adrian.